Chatting to our customers over our recent busy Apple and Honey Show Weekend it is apparent that the weather rather than Brexit is causing more problems and issues in our gardens. It has been a good year rather than a vintage year for fruit generally and the bees haven’t liked the wet and miserable late summer. Our preoccupation with “the weather” always brings a moment of anticipation when the weekend forecast appears on Gardeners’ World with the hope of good weather to provide that welcome great garden escape to potter, visit the odd garden (such as Stowe Landscape Garden or Evenley Wood just down the road) or maybe review the successes and non-performers of the season. If you like me like to “take stock” then planning is often the best therapy. Speaking of which I’m busy planning the talks programme and garden visits for 2018 so if you have any requests for subject matter or locations for our visits then do please let me know by e-mail chris@hedging.co.uk or a call on 01280 827910. As I write this the Shop Christmas displays are taking shape and there’s no denying the glitter, the brightness and fun - Elf On The Shelf, makes these cold and gloomy days a tad more bearable. Finally, spiders. Yes, I know I should have warned you earlier but as you’ve probably read in the newspapers there’s around 150 million strong invasion heading into our homes this winter! Hmm, try a few conkers dotted around your window ledges and block up those nooks and crannies - that’s all - sorted! Enjoy your winter garden - whatever the weather! CHRISTMAS HIGHLIGHTS Jingle those bells, the build up to the yuletide is upon us. moss covered pine cones to bristle animals and of course plenty of robins. The Silver area, one of our most popular themes at Christmas with an icy feel with silver, blues and pewter as an alternative to decorate your tree. The Gold area, the biggest and best theme of all, coming with a warm glow of gold, red, copper and purple. Along one wall we also have a kids and family themed area, which has a hint of a candy cane element to it with red, lime greens and white as its colour ways, plus the usual snow domes and small children's toys too! This area also includes children and family themed games, including fun family games of Charades, Trivia and Mind Trip - the perfect antidote to those extremes of indulgent eating and binge TV viewing! There are plenty of traditional gardening gift ideas instore too - including a good range of quality stainless steel garden tools, secateurs, gloves, children’s garden tools, propagators and greenhouse heaters. In our Food Hall, locally sourced beers and wines remain a firm favourite for gifts. Our 4 for £10 offer on selected bottled beers from local breweries includes - Concrete Cow, Gun Dog, Hornes, Silverstone Real Ales, Towcester Mill and Vale. If you fancy celebrating the big day with a glass of wine, do check out the range of locally grown wines from Chafor Wines, including their award winning Bacchus and Chardonnay wines. Delicious cakes and mince pies are offered from the Fatherson Bakery, including sponges, pies, loaf cakes, tray bakes and seasonal favourites too. Seasonal houseplants make great and colourful gifts. Our poinsettias will once again be coming from a local grower in Bedfordshire, so from late November onwards the houseplant department will be a blaze of glorious red as well some of the other coloured forms of Cyclamen, Christmas Cacti, Azalea and scented beauties - Jasmine, Stephanotis and Hyacinths. This plant grower also supplies us with planted arrangements - full of festive cheer and we’ll have a good range of reliable orchids too! Our real Christmas trees arrive in late November and will be beautifully shaped. They are sourced from the best Scottish growers and will include cut Nordmann Fir and Noble Fir which are excellent for needle retention and pot-grown Nordmann Fir and Norway Spruce. These trees will not disappoint, providing you follow the care instructions. Look out for our range of Root Candles as well as Wax Lyrical Church candles, pictured right with 15 to 115 hours burning time. 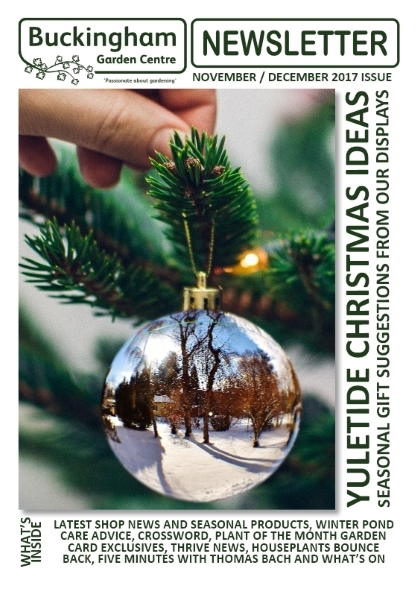 • … & many other gift ideas! 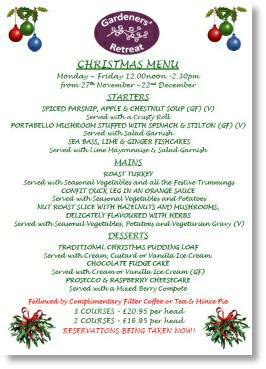 Christmas food is covered tastefully again this season with a full Christmas menu being offered in our Restaurant. Booking is essential on 01280 827907.  Click on the small menu to the left to download a copy of the menu and a booking form. With food ever growing in popularity at Christmas time why not indulge yourself as well as buying for your loved ones as we have plenty of treats to tempt you. We have a fabulous range from favourite companies such as Mrs Bridges, Cottage Delight for our savoury lovers and Bon Bon’s chocolates to help with those sweet-toothed stocking fillers. Amongst the new Mrs Bridges range you’ll see their 12 Days of Christmas, a pack of twelve different preserves for you to sample - a tasty alternative to the traditional chocolate advent calendar. The whole range has had a new look and the gift packs have expanded to include a Breakfast Collection which contains Fine Cut Orange Marmalade, Marmalade with Ginger, Pink Grapefruit Marmalade and Lemon & Lime Marmalade. The Best of Bridges does exactly what it says in the name, all of Mrs Bridges favourite products, including Ploughman's, Strawberry Preserve, Sweet Onion Relish, Fine Cut Marmalade and Raspberry Preserve. You will be able to find something for all the family from chocolate Santa’s for the grandchildren to hot sauce selections for dad. The popular savoury Cottage Delight offer is back in stock and on the 2 for £5 offer there are selected cheese snacks such as Gouda Cheese Stars, Cheese Twists, Cheese and Onion Pretzels and Savoury Christmas Trees. With plenty of Christmas food goodies to keep your table full we have also selected a new range of tableware and decorations, from tea light holders and place names to table cloths and runners. There is also a selection of animal wine stoppers to match with your decorations. Walton and Co. is the company behind the textured tableware with a choice of colour ways to match in with your tree. We’ll also have a range of those Christmas essentials - Pâté, Stuffing, Mint Jelly, Apple Sauce, Goose Fat and Mince meat. Finally, over the three weekends commencing 2nd December and running up to Christmas we’ll have delicious mince pies and fruity mulled wine (fruit squash as a non-alcoholic alternative) available to all our Garden Centre customers. Getting your pond ready for winter begins now, writes Chris Day. Water temperature, rather than air temperature, is the important indicator of when it's best to make changes to your pond. To prepare your fish and pond for a healthy spring, the first tool you will need is a thermometer. As the temperatures cool, it is harder for fish to digest food properly. Even though your fish need to bulk up for winter, be careful not to overfeed. You can feed 2-3 times a day then remove any excess food they have not eaten after five minutes or less. Once the water temperature falls to 50°F, the bacteria in a fish's digestive system are no longer able to process food efficiently. Switch to a wheat germ food, as this more easily digested, and stop feeding when the temperature drops below 40°F. It's always a good idea to trim and remove any dying plant material around the pond as it appears, so it does not add to debris build-up. Now is a great time to divide and repot plants. The mild temperatures will give the plant time to heal its root system before cold temperatures arrive, and will most likely provide more blooms the following summer if properly re-potted in an aquatic basket and fed. Trim the marginal plants back and trim water lilies before frost. Then set all hardy water lilies to the bottom, if the pond is deep enough to keep them from freezing to the bottom in the winter. All this activity may stir up things, so it's a good opportunity for a water change. You'll need to remove some of the excess debris or it will continue to decompose, using up oxygen and producing hydrogen sulphide, a toxic gas. A fine-weave aquarium net works well to sift out excess sludge. No need to completely drain and remove every bit of mud and debris, as a small amount is very helpful to the inhabitants for burrowing. A water change can be done any time in the autumn, but will be more comfortable for you if it's done before the water temperature goes below 60°F. A pond vacuum eases this process tremendously, so investing in one is highly recommended or if you are local there is one available for hire from our aquatics department. If a 25% water change still leaves the water murky the next day, perform another water change. Remember to use dechlorinator such as Interpet Fresh Start (250ml £8.99 or 500ml £15.49) if your tap water contains chlorine. 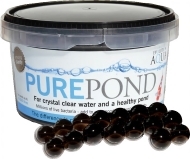 Also, use a bacterial additive (Evolution Aqua Pure Pond, 500ml £12.99 or 1-litre £24.99) designed for cool water application to ensure efficient biological filtration. 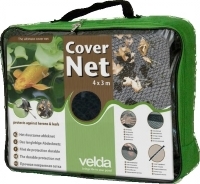 When the first leaf falls, it's time to cover the entire pond with netting such as Kelda Pond cover net (various sizes available). 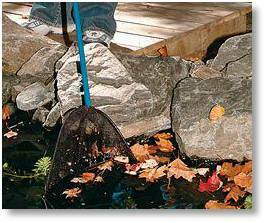 It's just about impossible to remove every leaf by hand, so covering your pond with netting saves a lot of time. The net is barely visible if properly stretched and anchored on the sides of the pond. It is very important to make sure the netting is above the surface of the water. As leaves gather, just remove the anchors on one side and flip the accumulated leaves off the net, then re-anchor. If you have a skimmer filter, be sure to remove collected debris daily to prevent potential clogs. When temperatures drop below 40°F, the main pump can be removed and filters thoroughly cleaned. However, many people leave the pump running simply to keep the water circulating and in mild winters this can be beneficial. You have recently qualified in horticulture – can you tell us about this experience? After qualifying with a Bsc (Hons) in Horticulture from Writtle University College my understanding of the industry has greatly improved. I’ve developed a keen interest in crop production and the science underpinning growing systems. I hope in the future to develop a career in commercial horticulture. We know this is going to be a difficult one, but if you were stranded on that castaway island, which plant would you like to take with you? My favourite plant would be the Jubaea chilensis (Chilean wine palm) as it’s the most southerly distributed palm in the world and frost hardy down to -12°C in less humid conditions. 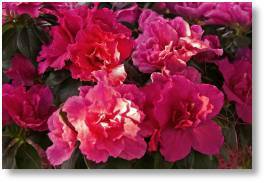 It is also a wonderful centrepiece to exotic gardens although grows slowly in the UK. And least favourite plant and why? My least favourite is Rhododendron ponticum (common rhododendron) as it’s very invasive to the UK and has taken out my woodland at home, growing in acidic soil. The plant is self layering so has the ability to emerge new off shoots at a rapid rate. Although the flowers can be nice! Your favourite edible and why? Rhubarb is by far my favourite vegetable. As a commodity is has many cultural uses - used as an ingredient in puddings, yogurts and ice creams. There are many varieties too, including ‘Champagne’, pale pink sticks; ‘Timperley Early’, early cropper with superb flavour and ‘Victoria’ with large cardinal red stalks with good productivity. Your favourite gardening activity and why? Propagation is by far my favourite practical task. 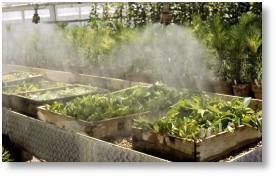 Using misting benches with heated benches has allowed horticulturalists to replicate and reproduce genetically identical plant material. Particularly so using softwood cuttings and tissue culture which is more of a biotechnology rather than gardening. Helping customers and sharing plant knowledge with them. Working as part of a team and giving suggestions. Do you have a gardening tip you would like to share with us? Did you know division is the best propagation method for plants with rhizomes and offshoots? Several plants can be potted on from one mother plant. My “super speed” when propagating and observing the progress of cuttings. 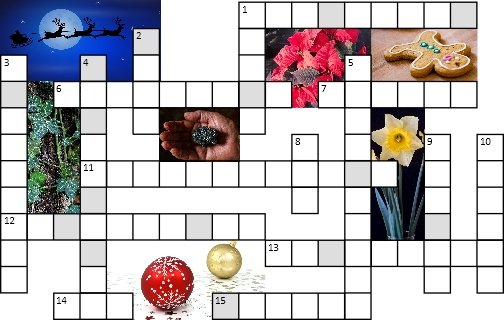 PUZZLE CORNER - OUR CHRISTMAS CROSSWORD! Would you like to win a £25 Buckingham Garden Centre Gift Voucher? Enter our crossword competition below. Use the clues to fill in the answers. 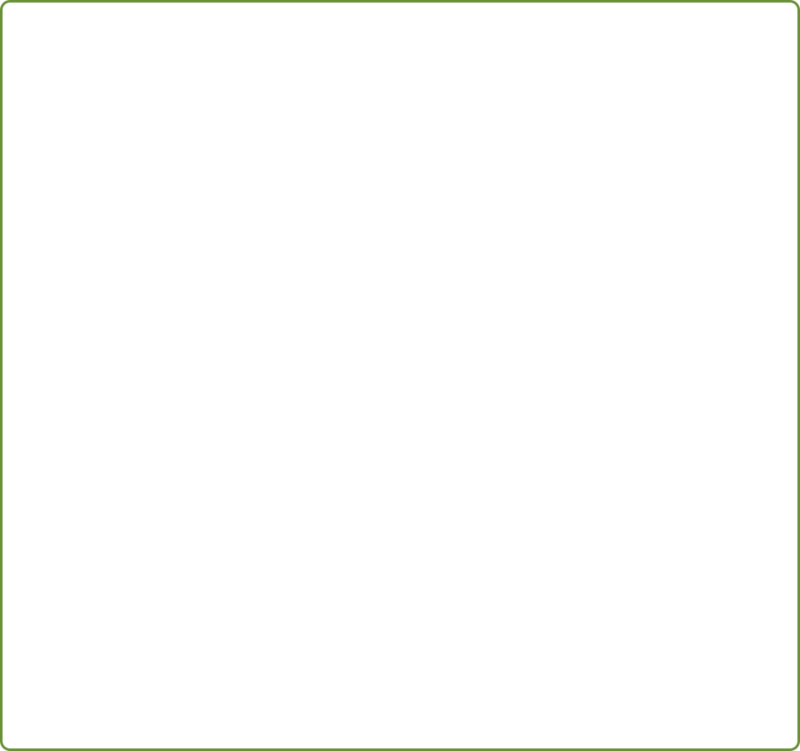 Take the letters from the shaded boxes which form an anagram of a popular Christmas house plant. Once you have solved the anagram, send the plant name you have discovered by e-mail to competitions@buckingham-nurseries.co.uk with subject line “November crossword” or post your entry to November Crossword Competition, Buckingham Garden Centre, Tingewick Road, Buckingham, MK18 4AE. Closing date 31st December 2017. The answers to the last newsletter’s crossword are available HERE. Congratulations to Chris Smith from Bradville, Milton Keynes who was the winner of the £25 Garden Centre voucher for getting the answer correct. Ethel has had an active and rewarding career, spending over 30 years working in London as a Midwife. When she developed a blood disorder called MGUS in 2003 she wasn’t unduly worried as in most cases this is a non-malignant condition and just needs monitoring. Unfortunately for Ethel this eventually developed into myeloma, a cancer affecting the bone marrow. As Ethel hadn’t been feeling unwell it was very daunting to receive her diagnosis and Ethel underwent a course of chemotherapy and a stem cell transplant. Six weeks after Ethel’s transplant a cancer support nurse suggested that increased levels of activity would be beneficial to Ethel’s recovery. She referred her to Beth, a Macmillan Move More Co-Ordinator for Enable Leisure & Culture, who told her about the gardening therapy programme at THRIVE Battersea, designed for those living with cancer. Ethel said that when she arrived at THRIVE in early Spring she was overwhelmed with the beauty of the plants and the setting. She joined the 6-week programme, working alongside others under the guidance of Horticultural Therapist Tim. This led to her going on to a further 10-week programme with THRIVE team at the Doddington Community Roof Garden. Ethel was introduced to weeding, planting, potting on and transplanting as well as learning how to care for all the different types of plants – she was completely hooked! 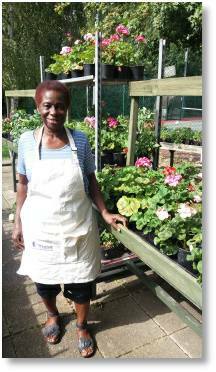 And it’s not just growing and looking after the plants that keeps Ethel busy, she is now a THRIVE Volunteer and works in our plant sales kiosk and says that she hopes other people come to discover THRIVE and the joy of gardening! • £20 can buy adaptive equipment to support a disabled gardener. • £35 can contribute towards purpose built raised beds. • £60 can improve site access for those with reduced mobility. 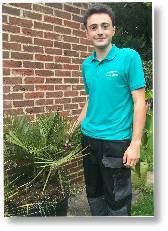 • £100 can help fund a recognised horticultural qualification. Please give what you can to help more people like Ethel. Leaving High Street Kensington underground station and turning down Derry Street there is no clue of what delights lie ahead. A completely unassuming entrance to no. 99 initially shows no clues either. 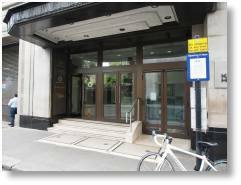 It appears like any of the many thousands of office block entrances across London. Steps up to a reception, canopy above, list of company names to the side. 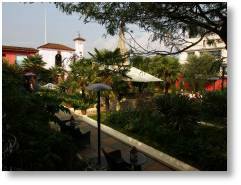 “Equinox Fitness Club”, “Warner Music”, “Babylon” and “The Roof Gardens”. The Roof Gardens?! Yes, that is what I am here to see today. Approaching the reception desk, you are greeted by friendly staff and asked to sign in (photo ID is required). You are directed to the lifts which quickly whisk you up to the 6th floor. When the doors open, you enter an impressive art deco style room. Walking through the café/restaurant area, you enter the gardens. And how impressive they are! Just stand here for one moment and think. We are on the roof, six floors up, of an office block in West London, and before us is a splendid, English Woodland style garden. In fact the Roof Gardens are split into 4 separate areas. 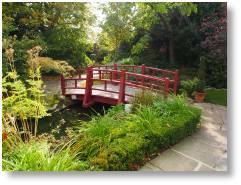 There is the English Woodland garden, a Tudor Garden, a Spanish Garden and a small Wildlife Garden. The English Woodland is planted up precisely as the name would suggest. At this time of year, the small trees were looking lovely, especially the Purple Beech and the Maples. The larger trees, like the Liquidamber, the Mulberry and the Japanese Maples have been in situ for 75 years. The area is also planted with thousands of Snowdrops, Bluebells and many other seasonal bulbs. A reason to return throughout the year! The art deco facade of the building and the strategically placed deckchairs on the steps all add to the feel of “English-ness”. Moving on from the English Woodland, you pass into the Tudor Garden area. Visually, this area is quite stunning. Tudor style archways and walkways take you through three large courtyards. The walls are covered with creepers and vines and once again you have to pinch yourself to realise exactly where you are. With Autumn on its way and the leaves just starting to change colour, the Tudor Garden area was an impressive sight. 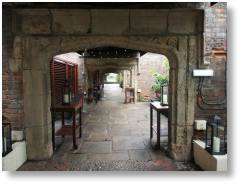 Moving through the archways and courtyards brings you to what is probably the best area of the Roof Gardens. Opening up in front of you is the Spanish Garden. With its whitewashed walls and red tiled roofs, this area emanates warmth even on a cloudy London day. Architecturally created in the style of the Spanish Moors, this area is based on the Alhambra in Granada, Spain from plans dating back to 1938. Pathways lead you through and around the borders and beside the cooling waterways. Chairs and tables are placed for you to sit with a drink to really soak up the atmosphere of this area. Along one side is an upper balcony furnished with sofas and cushions. A perfect place to relax and enjoy the view across the Spanish Garden area. Jazz music plays quietly in the background. ummer day in London just to kickback and relax for a while, which people were actually doing this very afternoon. Planting in the Spanish Garden is very clever. 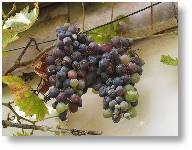 There are plenty of vines (with grapes in large bunches still hanging), olive trees, ferns and grasses and other Mediterranean species. But English plants are also used which can survive the cooler temperatures of our country. When you can finally drag yourself away from the Spanish Garden, you head for the exit. But not before passing through the Wildlife Garden. A small waterfall, ponds and b ridges are the home to some flamingoes and some exotic looking ducks! It is a nice end to the journey around the gardens. Make sure, as you walk around, to take time to look out in particular for Echinops ritros, Buddlejas, Lime trees, Vietnamese Corianders, Tangerine Sages, Lavender Spanish Eyes, Oak trees, Acacia dealbatas (Mimosa) and Morus (Mulberry trees). Heading back inside, why not grab a tea or coffee and a bite to eat before you leave. In fact, it would be the perfect place for a traditional afternoon tea and these can be booked on certain days. Or if you are feeling a little adventurous, why not treat yourself to a cocktail! And the best bit if all? Entry to the gardens is free. The gardens are owned and managed by the Virgin Group of companies and around the garden there are wishing wells and other places where you can donate to their chosen charity, which is the worthy Starlight (a charity granting wishes to terminally ill children). But don’t let this put you off. The Roof Gardens are worthy of a visit. 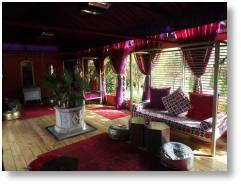 Whether you plan to go to the Babylon restaurant (overlooking the whole of the gardens) or for afternoon tea or just going for a stroll and to sit and take in each of the areas, it really is worth spending some time there. They often say trends and fashions in gardening go around in circles, says Chris Day. After a long absence the spotlight has now returned to Houseplants as they are enjoying a much deserved renaissance. The last time we saw such interest was back in the early 1970 and 1980s when all potted plants were fuelled by our fascination for potted greenery - think Cheese Plants, Rubber plants and Cacti. Today the range of plants has grown and includes more exotics - think orchids and air plants, however the likes of Bromeliads, those members of the pineapple family, all share one thing in common - they are easy to grow. 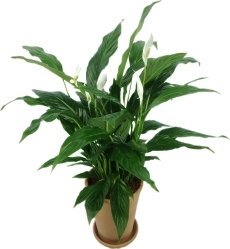 We have also seen the beneficial effects of growing houseplants in our homes, especially the likes of Peace Lilies (pictured right), Aloe Vera and Gerbera. NASA and their well documented Clean Air study found that certain plants were effective at removing benzene, formaldehyde, and trichloroethylene, xylene, and ammonia from the air -chemicals that have been linked to health effects like headaches and eye irritation. Many of these chemicals are found in glues and adhesives, new carpets, in household cleaners, foam insulation materials, some paints and pressed-wood products such as plywood, particle board, and medium-density fibreboard. The plants themselves are pretty popular in our homes already and include the likes of Mother-in-law’s tongue, Spider Plant (Chlorophytum), Dragon trees (Draceana), Flamingo plant (Anthurium),Weeping Fig (Ficus benjamina) and Ivy (Hedera helix). Houseplants in winter need some care and attention. Overzealous watering kills more plants in winter than under watering so keep plants moist in between periods of dryness. 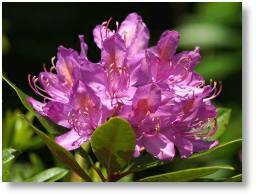 This rule applies to most plants, however, thirsty plants such as Azaleas (Rhododendron simsii, left), should be kept uniformly moist, especially through the flowering season. Do think carefully about location and temperature as this can influence how well a new plant establishes indoors, especially as we approach the busy Christmas plant buying period. Do please ask our Plant Team if you need houseplant advice on your next visit to us. Cool and light conditions indoors means your herb growing can continue on that spare windowsill through the winter. Mint, Sage, Parsley and Thyme amongst others can be kept growing and you can harvest in pots throughout the winter months. 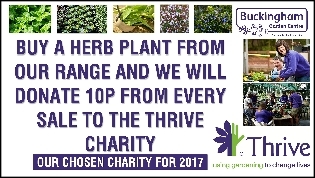 Best of all not only will you will be enjoying fresh herbs you will also be helping THRIVE with that 10p charity donation on all our 9cm and 1-litre plants too! EVERY SUNDAY Between 10am-4pm you can stock up on your fresh vegetables and fruit with Peter Miller and also purchase a superb range of competitively priced fresh meat and poultry from Lee of Crawley’s Family Butchers from Brickhill. LATE OCTOBER If you go down to the woods today… you're sure of a big surprise! As Autumn Colour draws to a close preparations begin for Halloween. 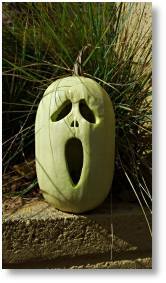 For the first time, Evenley Wood Garden will be open from 25th-27th October 11:00am till 4:00pm and they will be extending their opening times on 28th October and 29th October until 6:00pm when the Wood will be transformed into a Halloween Extravaganza under the cover of darkness. With torch in hand, are you brave enough to discover what is lurking in the undergrowth? A ghostly trail will lead you around the wood for lots of Halloween frights and things that go bump in the night! For the less adventurous, take part in our pumpkin carving workshop and carve out your own creepy creations (£3 per pumpkin) along with gruesome biscuit decorating. WEDNESDAY 8th NOVEMBER BGC’s Chris Day tackles winter houseplant care in his talk Taming The Indoor Jungle. There will be plenty of hints and tips on caring for flowering, foliage and unusual houseplants. All our talks are in the Talks Room in the Restaurant, at 4pm, and will last approx 45 minutes with time for questions afterwards. To book a seat call us on 01280 822133. Garden Club Members free, £3 for non-members. SUNDAY 19th NOVEMBER We will be welcoming Dogs For Good (formerly Dogs for the Disabled), based in Banbury, to our foyer for a charity day between 10am-4pm. They provide assistance dogs for adults and children with a range of disabilities and also for those suffering from autism or having special educational needs. SATURDAY 24th FEBRUARY 2018 is GRAFT AND GROW DAY Our apple scion wood exchange, grafting demonstrations and vegetable growing day will feature members of The Mid Shire Orchard Group offering an opportunity to swap scion (apple varieties) from wide and far and get them grafted (for a small charge), plus expert vegetable growing advice from members of the local National Vegetable Society. Details can be found on our Events page HERE. To download a PDF copy of our latest newsletter, please click here.